Are you looking to improve your curb appeal or increase the energy efficiency of your home? A great place to start is your doors. Your exterior doors face considerable wear and tear from the amount of traffic passing through each day. Your doors also need to insulate your home during the hottest days and the coldest nights. You’ll want a product that is up to the task. Feldco offers the most durable, insulated doors in Green Bay and professionally installed. We’re looking forward to working with you on your next exterior door project. Feldco offers a large selection of exterior doors with a multitude of options. Our energy efficient doors are designed to keep your home comfortable during all four seasons. Your entry door is front and center of your home and can be used to make a stylish statement. 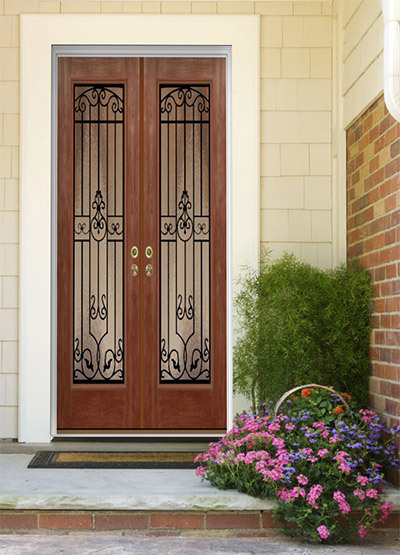 Feldco offers many styles of fiberglass and steel entry doors that will look elegant on your home. There are a variety of different wood grain finishes and colors available. 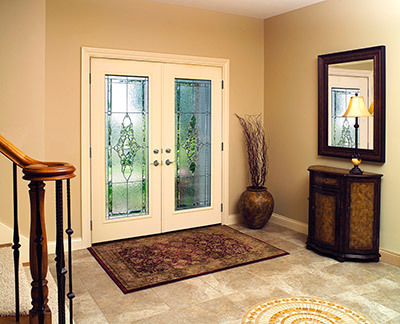 We also offer decorative glass and hardware options to further enhance your entry doors. 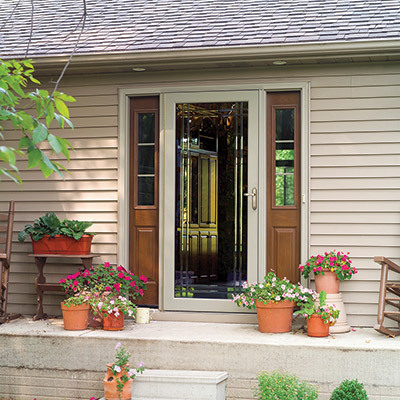 Green Bay residents love our affordable and elegant steel entry doors. 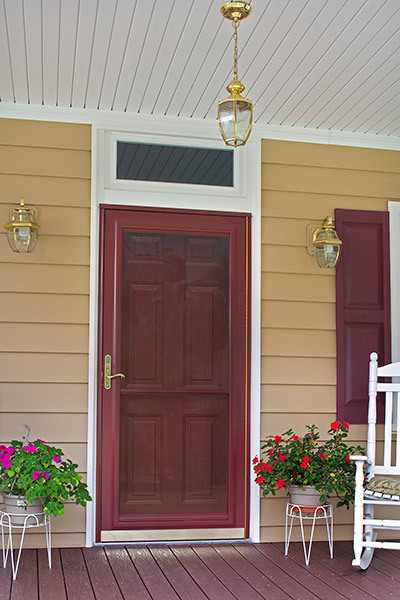 This affordable option still comes in many different color options and gives the owner a different feel than with the fiberglass entry doors. Whichever style of door you decide to purchase from Feldco, you are guaranteed the best in security, energy efficiency and curb appeal that Feldco Green Bay has to offer. Are you looking to protect your entry door from the relentless Green Bay elements or to provide additional ventilation and insulation for your entry way? Storm doors are the answer! The addition of a new door will form a barrier in front of your existing exterior door, blocking it from rain, snow and debris caused by heavy winds. Some styles of storm doors offer glass that can be replace with a screen so during the summer it will open up many more ventilation options to let fresh air into you home. Other styles have self storing or retractable screen. There are many different styles, colors and glass options to choose from that will enhance the appearance of your storm door. 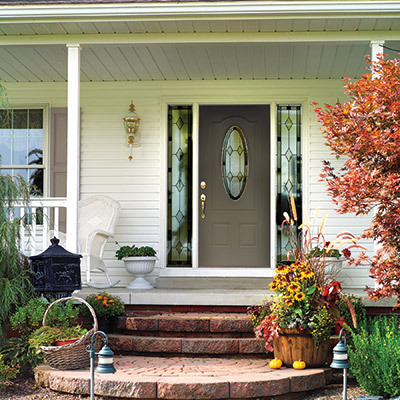 Storm doors from Feldco are an energy efficient way to improve your home’s curb appeal, insulation and protection. 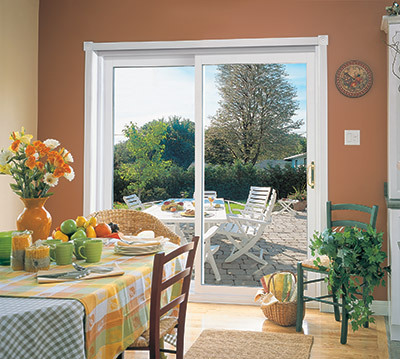 Patio doors are a great way to increase the amount of light entering into your home. 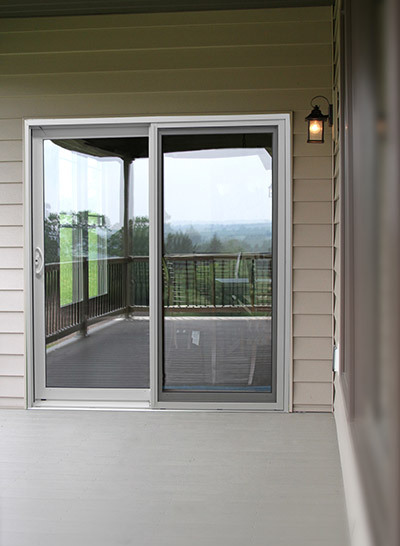 Our beautiful patio doors allow you to easily access your deck, patio, sun room or backyard. Depending on how much space you have, you can choose between a sliding or french patio door. No matter which one fits your needs, you are still getting the same energy efficiency and durability you would expect from a Feldco door. French patio doors can be installed to swing inwards or out from your home. Any of our entry door designs can be used on your patio door. With all of the color, grid and glass option you can choose between, you can customize your french patio door to your liking. Sometimes a room doesn’t have the space to permit a swinging door. Have no fear though – sliding patio doors are a gorgeous option. These doors allow the most control of ventilation and the greatest amount of light into your home with their large glass panes. Your installation team will do what it takes to complete your door replacement project. They do it all from carefully removing the old door to maximizing the energy efficiency of the opening. Once finished, they will clean up their mess before leaving your home more beautiful than ever before. Feldco’s goal is to delight every customer and that holds true throughout the installation process. The installation teams are factory trained and certified and are among the best in the home improvement industry. We make the entire door installation process very easy for you. So sit back, relax and enjoy your beautiful new door!